The Ohio Arts Council's current grant programs are grouped into four categories. Explore below to learn more about available grant programs, including deadlines, staff contacts, review criteria, and more. 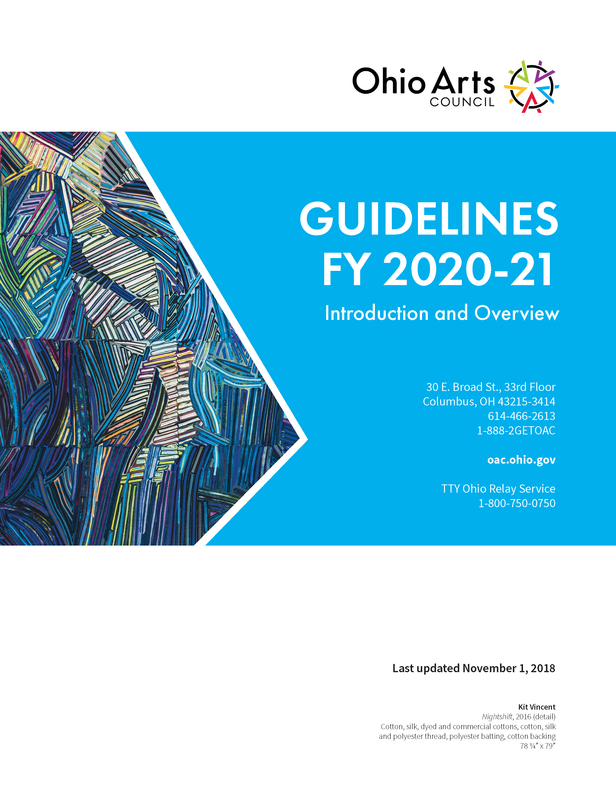 The OAC Guidelines 2020-21 describe how funds entrusted to the Ohio Arts Council by the Governor and Ohio Legislature are to be invested in arts and culture, as well as the expected returns on those investments: quality arts experiences that strengthen Ohio artistically, educationally, and culturally. Organizational awards will be made in operating and project support programs. Individual artists will be supported through programs that recognize excellence, preserve cultural traditions, and offer developmental support. Arts learning programs will fund a variety of purpose-driven experiences for educators and learners of all ages. Grant seekers are highly encouraged to review the Guidelines Introduction and Overview, as well as instructions for the ARTIE system. Log in to the ARTIE system to submit a grant application or manage your award. Check out the Grantwriting Tip Sheet before you apply. Review the Panelist Handbook before your meeting date. Complete the online Panelist Nomination Form. Click below to download the Arts Access PDF. Click below to download the Sustainability PDF. Click below to download the ArtSTART PDF. Click below to download the ArtsNEXT PDF. Click below to download the Capacity Building PDF. Click below to download the Building Cultural Diversity PDF. Click below to download the Artists with Disabilities Access Program PDF. Click below to download the Ohio Artists on Tour PDF. Click below to download the Arts Partnership PDF. Click below to download the TeachArtsOhio PDF. Applications accepted year-round, at least eight weeks prior to planned travel. Click below to download the Big Yellow School Bus PDF. Even-numbered years (e.g. 2018, 2020): crafts, design arts/illustration, interdisciplinary/collaborative & performance art, media arts, photography, visual arts 2D, and visual arts 3D. Click below to download the Individual Excellence Awards PDF. Click below to download the Traditional Arts Apprenticeship PDF. ArtsSTART DeadlineArtsSTART DeadlineApril 1, 2019The ArtSTART program provides flexible, accessible funding to help organizations complete short- term projects addressing a wide variety of goals and objectives. Most awards support the programming of new or emerging organizations, including first - time OAC appl icants, as well as new or established organizations in areas not served by other arts providers. GRANT AWARDS: A pplicants may request between $1,000 and $5,000. All awards require a 1:1 cash match. Arts Access Panel MeetingArts Access Panel MeetingApril 9, 2019 @ 9:30 AM - 4:30 PMThe Arts Access program supports ongoing arts and cultural activities in all genres that broaden opportunities for the general public to participate in the arts. This flexible two-year funding supports Ohio arts providers as they make artistic experiences available to their communities, positioning Ohio as a vibrant place to live, learn, work, and visit. GRANT AWARDS: Applicants may request between $1,000 and $5,000. All awards require a 1:1 cash match. ELIGIBILITY: All applicants must possess nonprofit status or nonprofit intent, but need not be registered with the IRS as a 501(c)(3) nonprofit. Arts Partnership Panel MeetingArts Partnership Panel MeetingApr 11, 2019 @ 9:30 AM - Apr 12, 2019 @ 4:30 PMThe Arts Partnership program supports arts education projects that address the needs of individual learners and their communities. Grant recipients engage in collaborative planning with partners, emphasize in-depth study of the arts, and use arts learning outcomes and standards-based arts education practices. By supporting these projects and programs, the OAC strengthens arts education locally, regionally, and statewide. GRANT AWARDS: Applicants may request between $4,000 and $25,000. All awards require a 1:1 cash match. Traditional Arts Apprenticeships Panel MeetingTraditional Arts Apprenticeships Panel MeetingApril 16, 2019 @ 1:30 PM - 3:30 PMThe Traditional Arts Apprenticeship program provides support for master artists to work with apprentices to build understanding and proficiency in folk and traditional art forms. By pairing exemplary practitioners of traditional art forms with dedicated apprentices, this program allows for concentrated study and cultural exchange. Traditional Arts Apprenticeship awards support the teaching and sharing of important cultural traditions, and enrich the lives of people throughout the state. GRANT AWARDS: Master artists may request up to $4,000 to work with one, and if appropriate, two, apprentices. At least 50 percent of the request must be used for master artist honoraria. No match is required. Sustainability – Central and Southeastern regions – Upper Budget Tier – Day OneSustainability – Central and Southeastern regions – Upper Budget Tier – Day OneApril 17, 2019 @ 10:00 AM - 4:00 PMThe Sustainability program supports ongoing arts and cultural activities in all genres. Awards support the largest and most administratively sophisticated organizations in the state's arts and cultural ecosystem. This flexible and reliable funding supports a wide range of the state's arts providers as they make high-quality artistic experiences available to residents and visitors, positioning Ohio as a national leader in creativity, artistry, and cultural wealth. GRANT AWARDS: Grants vary in size and are determined by a formula that takes into account panel evaluation of each application and the applying organization’s operating income. All awards require a 1:1 cash match. Sustainability – Central and Southeastern regions – Lower Budget Tier – Day Two Sustainability – Central and Southeastern regions – Lower Budget Tier – Day Two April 18, 2019 @ 10:00 AM - 4:00 PMThe Sustainability program supports ongoing arts and cultural activities in all genres. Awards support the largest and most administratively sophisticated organizations in the state's arts and cultural ecosystem. This flexible and reliable funding supports a wide range of the state's arts providers as they make high-quality artistic experiences available to residents and visitors, positioning Ohio as a national leader in creativity, artistry, and cultural wealth. GRANT AWARDS: Grants vary in size and are determined by a formula that takes into account panel evaluation of each application and the applying organization’s operating income. All awards require a 1:1 cash match. Sustainability – Western and North Central regions – Upper Budget Tier – Day One Sustainability – Western and North Central regions – Upper Budget Tier – Day One April 23, 2019 @ 10:00 AM - 4:00 PMThe Sustainability program supports ongoing arts and cultural activities in all genres. Awards support the largest and most administratively sophisticated organizations in the state's arts and cultural ecosystem. This flexible and reliable funding supports a wide range of the state's arts providers as they make high-quality artistic experiences available to residents and visitors, positioning Ohio as a national leader in creativity, artistry, and cultural wealth. GRANT AWARDS: Grants vary in size and are determined by a formula that takes into account panel evaluation of each application and the applying organization’s operating income. All awards require a 1:1 cash match. Sustainability – Western and North Central regions – Middle Budget Tier – Day TwoSustainability – Western and North Central regions – Middle Budget Tier – Day TwoApril 24, 2019 @ 10:00 AM - 4:00 PMThe Sustainability program supports ongoing arts and cultural activities in all genres. Awards support the largest and most administratively sophisticated organizations in the state's arts and cultural ecosystem. This flexible and reliable funding supports a wide range of the state's arts providers as they make high-quality artistic experiences available to residents and visitors, positioning Ohio as a national leader in creativity, artistry, and cultural wealth. GRANT AWARDS: Grants vary in size and are determined by a formula that takes into account panel evaluation of each application and the applying organization’s operating income. All awards require a 1:1 cash match. Sustainability – Western and North Central regions – Lower Budget Tier – Day ThreeSustainability – Western and North Central regions – Lower Budget Tier – Day ThreeApril 25, 2019 @ 10:00 AM - 4:00 PMThe Sustainability program supports ongoing arts and cultural activities in all genres. Awards support the largest and most administratively sophisticated organizations in the state's arts and cultural ecosystem. This flexible and reliable funding supports a wide range of the state's arts providers as they make high-quality artistic experiences available to residents and visitors, positioning Ohio as a national leader in creativity, artistry, and cultural wealth. GRANT AWARDS: Grants vary in size and are determined by a formula that takes into account panel evaluation of each application and the applying organization’s operating income. All awards require a 1:1 cash match. Sustainability – Northeastern region – Lower Budget Tier – Day One Sustainability – Northeastern region – Lower Budget Tier – Day One April 30, 2019 @ 10:00 AM - 4:00 PMThe Sustainability program supports ongoing arts and cultural activities in all genres. Awards support the largest and most administratively sophisticated organizations in the state's arts and cultural ecosystem. This flexible and reliable funding supports a wide range of the state's arts providers as they make high-quality artistic experiences available to residents and visitors, positioning Ohio as a national leader in creativity, artistry, and cultural wealth. GRANT AWARDS: Grants vary in size and are determined by a formula that takes into account panel evaluation of each application and the applying organization’s operating income. All awards require a 1:1 cash match.